Andean Cats Leopardus jacobita are one of the most beautiful of all wild cats. The fur is mainly ash grey with brown-yellowish blotches that are distributed as vertical lines at both sides of the body, giving the appearance of continuous stripes. Extremely thick, plush fur of silvery grey is very fine and soft, up to 5 cm long on the back, and the underside is pale with dark spots. Prominent dark grey bars also run across the chest and forelegs. The backs of the large, rounded ears are dark grey, and the nose is black. The legs also have dark and narrower blotches or stripes, but they don’t form complete rings. Large feet are marked with blackish bars and spots, and the soles are greyish-brown. Their magnificent tail is about 70% of the body length. Because the tail’s underside has hair as long and as thick as the upper side, it appears perfectly round. It is ringed with six to nine dark bands, and has a black tip. The long tail is probably used for warmth, wrapping it around the body when asleep, tucking their nose inside. The Andean Cat is a medium-sized felid; from measures of skins the total length in adults varies from 740 to 850 mm; tail length is from 410 to 485 mm. Only two records on the weight are available, the first from a sub-adult specimen in Peru, which weighed 4 kg, and the second from an adult female which weighed 4.5 kg. There is no variation between the fur colour of males or females, but differences between juvenile and adult specimens have been found. The juveniles have a lighter colouration and more and smaller blotches, which means the young can be confused much more easily with Pampas Cats Leopardus colocolo. The Andean cat occurs in Argentina, Bolivia, Chile and Peru and the northern Patagonian steppe in Argentina. They are apparently very specialized in their habitat requirements, having been found in the rocky arid and semi arid zones of The Andes above the timber line, up to 4, 000 metres. Vegetation consists mainly of small scattered dwarf shrubs and clumps of bunch grass, with numerous rock piles and boulders. In 2002, an Andean Cat and kitten were sighted in a reserve in San Juan province, Argentina, which extended their known distribution south by 500 kilometres. Field work in 2004 found evidence of these cats in the foothills on the eastern side of the Andes Mountains at an altitude of 1, 800 m. These new records are the lowest ever reported, and extend their distribution to scrub habitat within the Patagonian steppe. The foothills population has a patchy distribution, and is thought to coincide with that of their main prey species. A population estimate in northern Chile estimated one cat per 5 km². Reduced genetic diversity has also been found in the northern Chile population, suggesting a small historic population size. Signs of their presence decreased with proximity to human settlement. A survey conducted in northwestern Argentina at an elevation of approximately 4, 200 m estimated densities at 0.07 and 0.12 cats per km2 . The total population size could be below 2, 500 adults, with a declining trend. Their distribution coincides with the historic range of the mountain chinchilla, which was hunted to the brink of extinction for the fur trade a century ago. The ecology and behaviour of these cats is barely known. Most of the reported sightings of Andean Cats have been during daytime; however, current studies through camera traps and observations of a radio-collared animal indicate the activity is mainly at night or crepuscular. The activity pattern of the Andean Cat is likely related to feeding habits of its main prey species. Their diet reveals a preference for the mountain viscacha, which lives in patchily distributed small colonies, and which has also declined due to hunting pressure. Researchers have found that Andean Cats are much more dependent on the viscacha than the Pampas Cats, which take a wider variety of prey. 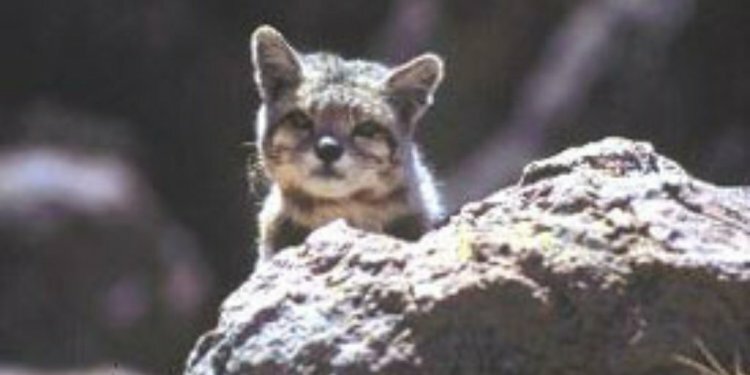 Pampas Cats were also more abundant that Andean Cats, even at higher altitudes, and competition for prey could negatively impact the Andean Cat. The Andean Cat is a solitary species, but may be seen in pairs or with cubs during mating season and after births. Mating season, according to local people in Bolivia, is between July and August; however is possible that this period is extended until November or December due to the fact that small cubs have been observed in October and April. Nothing more is known of their reproduction, and there are none in captivity. The Andean Cat is the most threatened felid in The Americas. Despite great concern regarding the status of this species, very little is known about its population structure, which is crucial data for appropriate management plans. Habitat loss though extensive mining, resource extraction for fuel, and cattle grazing are the main threats to these cats, followed by hunting of the cats and their prey. Hunting by local people who consider the Andean Cat a predator of their small domestic livestock has been frequently reported. The cats are also killed by dogs accompanying local shepherds, and hunted for food and traditional medicine in Peru. Andean Cats are considered sacred animals according to indigenous traditions. Throughout much of their range, dried and stuffed specimens are kept by local people for use in harvest festivals. Hunting for such cultural practices may represent a significant threat to the species. In Argentina’s Catamarca province, 69% of people interviewed said they had hunted the small cats. This cat was first described in 1865 from a skin collected near the Bolivia-Argentina border. Until recently, information was limited to three skulls and 14 skins in museums. However, the number of recent distribution records has greatly increased due to the efforts of the Andean Cat Alliance, a network of specialist researchers formed in 1999. While the Andean Cats has full protection at national levels, law enforcement is difficult, and recently hunted specimens have been observed in the field and for sale in special markets. The Andean Cat is protected by National Law 22421 of wildlife conservation and its Statutory Decree 666/97. Also, Resolution N°63/86 of the Secretary of Agriculture.